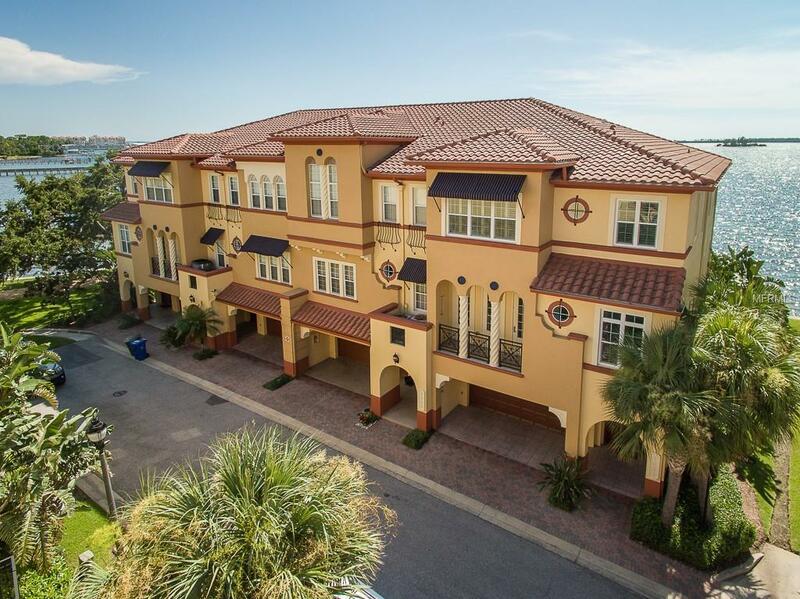 Arguably the best panoramic and breathtaking water views you will find on the Pinellas west coast from this fabulous 3 story townhouse located in the "Tuscan themed architecture gated community of Villas of Seagate. Nestled strategically near sought -after, happening, downtown Dunedin and minutes to the award winning beaches of Caladesi and Honeymoon Island, while your backyard is St Joseph Sound creating the feel of "being on a cruise ship! This rarely available gem delivers many terrific features, including a private elevator servicing all 3 floors, 3 balconies/patio, tandem garage with at least 3 car capacity, chefs kitchen with granite counters, island, and gas stove, coffered soaring volume ceilings, many architectural niceties with columns, arches, elegant large tile flooring, and so much more!Refrigerator is around 4 years old, dishwasher and garage door opener within the last few months. This community has heated pool, spa and its own private beach! Close to golf courses, hospitals, great restaurants, malls, Pinellas trail and airports, Make this your dream property today!